"There are few weapons that Banshee-44 has not seen, and fewer still that he cannot fix." Banshee-44 is an Exo Gunsmith, located within the Tower on the far right side of the Bounty Tracker and the far left of the Cryptarch. He sells weapons for field testing, telemetries that increase upgrade weapons for a certain type of weapon, and ammo synthesis items for Guardians. He can also sell legendary weapons that arrive on Armsday, if the player has earned enough reputation by testing weapons for him. As with all Exos, Banshee-44 has no recollection of his former functional purpose. In fact, he may have had his memory wiped multiple times, more than forty by his own reckoning and according to the suffix of his name. Still, he has some faint recollections of his past. Following reactivation, Banshee-44 made his way to the Last City, setting up a shop selling guns and ammo synthesis packs to Tower Guardians. At some point he was an active duty soldier, and saw action in the Twilight Gap. Banshee-44 attended the funeral of the Warlock Albios on the moon of Io following the Guardian's last stand. He and Cayde-6 became bored during the long ceremony and he bet that Cayde could not make several risky jumps on the nearby mesas. Although Cayde broke both his legs, he won the bet, and Banshee gave him some loot in exchange. When a newly risen Guardian from the Cosmodrome in Old Russia arrived to requisition a new weapon, Banshee offered them a choice between a Marshal-A, Psi Umbra I, Trax Callum I, and a Duke Mk. 10. He reassured the Guardian that he kept them all cleaned and prepped so they would not jam. Banshee-44 survives the beginning of the Red War with the Red Legion invading the Last City and destroying the Tower. Fortunately, the Vanguard was able to liberate the Last City and set up a new command center at the New Tower. Banshee then sets up a new work station, continuing his work at providing, fixing and upgrading weapons for the Guardians. When Lord Shaxx instituted a new ranking system in the Crucible, Banshee began workshopping ideas for a prototype weapon to arm one of the top-ranked contenders with. While watching one match, Banshee noticed a Exo Titan who scored numerous double kills and was informed by Shaxx that the Guardian was Redrix-3. As Redrix rose in the ranks of the Crucible, his skill with pulse rifles inspired other Guardians and resulted in Banshee being unable to keep up with all the new orders for weapons of that type. This inspired Banshee to begin construction on a pulse rifle, but he asked Shaxx to continue testing Redrix's skills in the Crucible. After Redrix passed his tests, Banshee and Shaxx provided him with Redrix's Claymore. Banshee subsequently began producing a successor to the weapon, which he dubbed Redrix's Broadsword, which would be awarded to Guardians who followed in Redrix's footsteps in the Crucible. "Rather lose every last memory in my head than know that little prince holds Cayde's prized cannon: the Ace of Spades. You gotta promise me. Put Uldren in the ground. And get the Ace of Spades back. If anyone should have the Ace... S'you." In the aftermath of Cayde-6's murder at the hands of Prince Uldren Sov of the Reef, Banshee grieved the death of his close friend. As the Young Wolf prepared to depart from the Tower to hunt down Uldren in the Tangled Shore, Banshee spoke with them and admitted that while his memory was not what it used to be he would never forget Cayde. He also informed them that Cayde's will stipulated that whoever killed him got all his worldly possessions, but Banshee was outraged at the thought of the treacherous Prince of the Reef claiming ownership of Cayde's prized Ace of Spades, which Banshee had helped forge. He asked the Young Wolf to promise him that they would kill Uldren and recover the Ace of Spades. When the Young Wolf returned after killing Uldren and retrieving the Ace of Spades, Banshee was pleased that the traitor was dead and Cayde's prized weapon had been recovered. However, he saw that the Ace had been badly damaged during its recovery and needed to be repaired before it could be used. Banshee revealed that Cayde kept spare parts for the Ace in his loot stashes that he had scattered throughout the solar system, which Banshee informed the Young Wolf were now theirs as well, and requested that they find the caches so they could use the parts to repair the Ace. After all the parts were located, Banshee utilized them to repair the Ace. Pleased with his work, Banshee began to ask the Young Wolf to remember something when using the gun, but lost track of what he was saying. Confused by the conversation, he asked the Young Wolf if they had seen Cayde around recently, unable to remember that his friend had perished. Several months later, the Young Wolf brought another broken hand cannon to Banshee for advice on fixing. Upon seeing the mangled husk of a Thorn, he remained quiet for a few moments before telling the Guardian that while he did not mind helping them, he would have to report the weapon to Ikora. Banshee also recommened just throwing the frame away and making a different weapon from scratch before dutifully providing the Young Wolf with a list of materials needed to fix the dreaded and forbidden weapon. Once he finished and the Young Wolf left, Banshee unfortunately forgot the details of the conversation and did not report the Thorn to Ikora. Banshee-44 exhibits a somewhat depressed mood, likely lamenting about his wiped memory banks, but also shows a dry sense of humor. Banshee-44 has a rotating stock of weapons available, from Common to Rare in quality. He also sells consumables for players to give them some much-needed help in firefights, such as ammo synthesis, which refills ammo for a weapon with varying cooldowns, or weapon telemetries, which speeds up weapon upgrade progression. Banshee-44 serves as a vendor with his own reputation rankup packages. 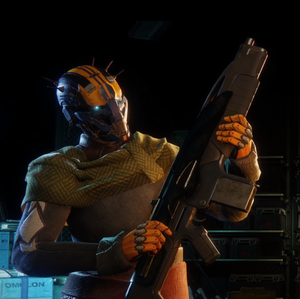 Gunsmith Materials (earned from dismantling rare, legendary and exotic weapons and armor) and Gunsmith Telemetry (earned by getting a certain amount of Arc, Solar or Void kills while an appropriate Gunsmith Telemetry Ghost is equipped) can be turned in to Banshee-44 to receive weapons. Banshee-44 is able to reward all the foundry (read: Hakke, Omolon, Suros and Veist) weapons and weapons rewarded by Devrim Kay, Sloane, Failsafe and Asher Mir. He is unable to reward any Vanguard or Crucible non-foundry weapons. Banshee-44 sells random rare and legendary mods. He is also able to convert 3 of the same rare mod into 1 legendary mod, provided the player is at 280 Power or higher. At reputation level 1, Banshee will allow players to purchase with 2500 glimmer (as opposed to Legendary Marks) a legendary weapon that will arrive on the next Wednesday with randomized perks. For each reputation level, Banshee-44 will allow players to purchase another weapon for armsday, as well as increase the number of roll options for Armsday. For example, at rank 3, a player can purchase 3 weapons, and when armsday comes around, they have three different choices per weapon for what modifiers they want. Any weapon with the "Reforge Ready" perk (mostly House of Wolves and Iron Banner weapons) can be taken to Banshee-44 to have its perks and elemental modifier (if any) randomized, at the cost of resetting upgrade progress. This costs one Mote of Light, 3 Weapon Parts, and 250 Glimmer. Banshee plays an important part in acquiring multiple exotic weapons through exotic quests personalized by what class you play as. At rank 2, Banshee-44 will have a Quest for a class-specific legendary special weapon. This must be completed to enable the exotic weapon quest. Hunters receive Stillpiercer, Titans receive Immobius, and Warlocks receive Susanoo. Upon reaching Gunsmith rank 3, Banshee-44 will offer the player a quest which will reward one of three Exotic weapons depending on the player's class. Hunters will receive Ace of Spades Hand Cannon, Titans will receive Fabian Strategy Auto Rifle, and Warlocks will receive Tlaloc Scout Rifle. At rank 5, Banshee-44 will have a new quest. He will require the player to get kills with Hand Cannons while a telemetry is active. Then the player has to wait until Armsday to pick up a field test weapon called Imprecation. They must infuse the weapon, get kill sprees with it, and then precision kill sprees. They must then wait for another Armsday delivery to get The First Curse. To trigger this quest, players need to find and collect four "Dark Age Relics" that randomly drop from Major and Ultra enemies; the relics appear as Legendary Fusion Rifles (labeled "DVALIN-RAS8711-FR00x", with the "x" being a number between 1 and 4) that are added to the Mission items section of the player's inventory. These items can be given to Banshee-44 for 200 reputation each. From there, the player will have to perform a series of missions and puzzles involving recovered artifacts. See Sleeper Simulant for more details. Once these puzzles are complete, Banshee-44 will take the completed IKELOS Fusion Core and will have the player come back at the next Armsday. Similar to Destiny 1, Banshee-44 plays an important role in several exotic weapon quests. Upon receiving the MIDA Mini-Tool from Devrim Kay in the EDZ World Quest "Enhance" (or alternatively, transferring the MIDA Mini-Tool from another character), Banshee will have this quest for you. Step 1 - Eliminate 50 enemies with a scout rifle + Eliminate 25 groups of enemies without reloading. Step 2 - Dismantle 5 rare or legendary scout rifles. Step 3 (The Fall Will Kill You quest) - Kill 50 enemies with an SMG while airborne (this can be done while standing on anything that isn't the ground. Walls, rocks, cars, etc. all count as being airborne). Step 4 - Return to Banshee to receive your MIDA Multi-Tool. "You gotta promise me. Put Uldren in the ground. And get the Ace of Spades back. If anyone should have the Ace...S'you." After the death of Cayde-6, Banshee challenges players to take the Ace of Spades Back from Uldren. "Reef work, alright not bad. Too fancy. I can fix that." "Shotty, as if I wouldn't notice. All my wipes, seen all the tricks." "Late shipment again. Strikes, shortages, always some excuse." "What was the name of that officer? Only I remember her, and so little. How her rifle jammed, then gone." "The fires below us as we dropped on the coast." "Are those teeth marks? Nasty." "Wolk Howling, on the field where he fell. Never gets better for some." "Told him it wouldn't stop Cabal. Some men never listen." "What was her name. Fierce eyes, full of light. The hell was it." "Nadir aren't what they used to be. I remember the new guy's grandfather." "Exos don't dream, he said. But what's dream, and what's memory?" *grumbles* "Just fix the gun, Banshee." "Very good. Must let Cassoid know this is adequate. But don't let it get to their heads." "Of course I can. Forgotten more about guns than she's ever known." "How many times has my system been wiped. 41, 42, 43?" "All these lives on the line, and Daito wants more Glimmer. What goes through their heads down there?" "Best Exo I ever served under up and vanished one night. That's war." "First time was incompetence, this time it's sabotage. Get to the bottom of this." "Nice marks on your armor. Never seen them before. What made them?" Banshee-44 is voiced by John DiMaggio. he has been rebooted 43 times. Banshee seems to have a past where he smuggled weapons that the Vanguard didn't know about to Cayde-6, judging by his line in the Grimoire card for the Ace of Spades. Until the completion of the Destiny 2 campaign, Arcite 99-40 takes his role as a gunsmith at The Farm. Banshee takes on an alternate pose in his vendor screen for the duration of the Forsaken story, crossing his arms and brooding while looking off into the distance. He reverts back to performing maintenance on a SUROS auto rifle after the player restores the Ace of Spades back to its former glory. Banshee-44 at his weapon shop. Banshee-44 brooding after the demise of Cayde-6. ↑ 1.0 1.1 1.2 1.3 1.4 Bungie (2014-6-12), Destiny: Alpha PlayStation 4, Activision Blizzard.